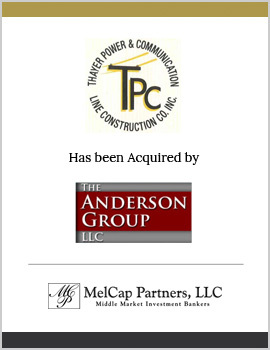 Thayer Power & Communication Line Construction Co., Inc., a Debtor-in-Possession, (“Thayer”) is a leading provider of utility line repair and construction services. The Company is primarily engaged in the construction and repair of power and communication lines in the states of Pennsylvania, Ohio, New York, and Kentucky. MelCap Partners successfully represented Thayer, the Debtor, as the Company’s exclusive investment-banker and financial advisor through a reorganization under §363 of the Chapter 11 Bankruptcy Code. Thayer was sold to The Anderson Group, LLC, a private equity firm with offices in the United States and China.